I'm from Concepción and have been working in Santiago for little over a a year. On May 10 this year I decided to take some photos at Parque Forestal, taking some 10 shots which I downloaded to my PC the following day . 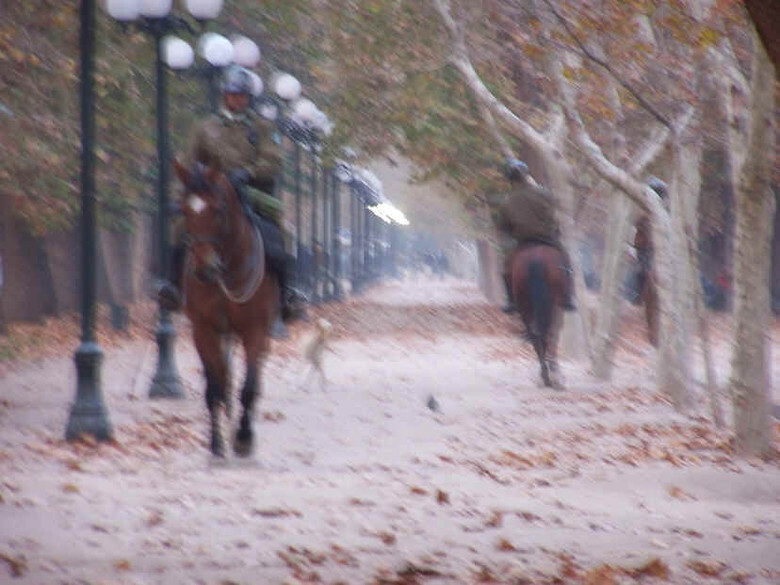 I thought it would be interesting to photograph a group of Carabineros (state police) on horseback patrolling the sector. The photo was taken at 17:40 hrs approximately from the corner of JM de la Barra and Av. Cardenal José María Caro, in front of bellas Bellas Artes and looking east. It was a cloudy day and the sun was hidden, for which reason my digital camera ( Kodak DX6490) adjusted to low speed (1/10 seg.. This is the reason why the photo shows motion (those knowledegable about photography will know the reason why)Furthermore, the Carabineros were som 20 meters distant, and I employed the camera's optical zoom (10x) which added to the blurred result. The fact is that I am very impressed by this image. I attest to the fact that it is not a fraud nor anything similar. For this reason I have made it public and I contacted the staff of CIFAE Chile. I would like to know the true nature of the image that appears in it and if anyone has ever caught anything similar in a photo. Nothing more. Translation (c) 2004. Scott Corrales, Institute of Hispanic Ufology (IHU). Special thanks to Liliana Núñez O. In regard to the analysis of the Parque Forestal photograph, CIFAE delivers this interesting report by our scientific director to the international UFO research community. In this work we shall present a brief introduction to the restoration of images by means of deconvolution, which is the only correct technique for eliminating certain defects from images. We also attempt to restore the Parque Forestal image, although in this case it isn't possible to obtain very good results. We are not trying to debate what the subject of the photo is or is not, nor if it is of interest to ufology. The main subject under discussion here (restoration) should be of interest to any researcher who works with images. An image distorted by being out of focus, astigmatism, "motion blur", atmospheric disturbances, etc. is mathematically represented as the convolution between the non-defective image and a PSF (point spread function). PSF is a function that can be interpreted as the distorted image of a white spot on a black background, and each image can have a different PSF depending on the camera and the conditions under which the image was acquired. In order to restore the image and to eliminate these defects, one must perform the reverse operation, in other words, deconvolute the distorted image against the corresponding PSF. Deconvolution isn't hard to achieve, but the deconvolution algorithms tend to be sensible to the image's "noise" (fluctuations) and iterative methods can easily diverge. The worst problem arises when the PSF isn't known a priori, and in this case it is necessary to develop some method that can extract the PSF from the defective image, what is known as blind deconvolution. This problem can be hard to deal with, and may be considered as one of the great challenges of the field of image analysis. It is also interesting to note the recent work of Alfred Carasso, who has achieved very impressive results, although the applicability of his methods is limited. It is hard to find commercial software capable of performing blind deconvolutions. Some programs like AutoDeblur have been specifically developed for microscopy. The Unshake program is a general purpose one, but is based on a very simple method that doesn't always work well. Other software packages like Iris are only useful in astrophotography. The majority of the available programs require a priori knowledge of PSF, such as Unblur, which is general purpose. FocusFixer is only useful in dealing with out-of-focus image and Focus Magic corrects simple out of focus and motion blur. For the time being we do not have access to a better commercial software package, therefore the Parque Forestal image was restored searching for PSF by simpler means. Knowing the basics of deconvolution, it is possible to know something about PSF by simple inspection of the photo. One can see that it appears in motion blur at angle of some 150 degrees. Using the Fix Motion Blur filter in Focus Magic at this angle, the distance could be established through trial and error, and turned out to be 11 pixels. In other words, the PSF that accoutns for the motion blur would be a straight line with a length of 11 pixels at an angle of 150 degrees. Upon eliminating the motion blur, it can be seen that the image is folded in the same direction (150 degrees) and at a distance of 17 pixels. In other words, the PSF that acknowledges this unfolding is two points at a distance of 17 pixels and at an angle of 150 degrees. The PSF was built using this inforamtion and the image was deconvoluted using Unblur. Focus Magic could not correct the unfolding. The result is shown in Figure 2, where it is noted that the image is partly restored, but with an increase in the amount of "noise". Contrast was not augmented artificially. The original photo has a lower contrast because the colors and shapes are mixed when an image is hazy, and upon restoring it, the colors and details of the real scene are also recovered. -Due to poor lighting, a weak signal was obtained with excessive motion blur due to the long exposure time (0.1 seg). -The object of interest is moving and has a different, more sever motion blur than the static objects in the scene. -The image is compressed, which truncates the information necessary for its restoration. In other words, the photo is compressed in the JPG format, which eliminates part of the information contained in the original image in order to reduce the storage size. The lack of lighting brings as a consequence an excessive amount of noise, especially in the restored image. This implies that there isn't a single PSF for the whole photo, which makes restoration difficult. On the other hand, any evidence of motion may be useful in intepreting the image. In our restoration, at least, some details and colors can be distinguished, and from the photo analysis point of view, it is the best that could be done in this case. Regarding the possibility of fraud in this photo, it would be easy to dot. The figure could have been pasted on the photo and the resulting borders could ahve been erased through motion blur. On the other hand, the photo's EXIF could have been edited in order to simulate an original photo. But the fact that it is easy to forge does not constitute evidence of a hoax, although it could provide good grounds for ignoring this case or not taking it seriously. We have hitherto not received any valid arguments supporting the hoax hypothesis. Some have said that some lines or squares of well-defined borders can be noted, but this is only a defect of the JPG format. In closing, something should be said about other image processing techniques. Some effects that highlight the image's details are very common, such as contrast and saturation, sharpening, unsharp mask, border detection, emboss, solarizing, etc. But it is obvious that none of these filters would be capable of restoring an image such as the one in Figure 1. many of these filters are deceptive because they alter the image, giving the false impression of having improved it, but they are at times only useful for aesthetic purposes. It is advisable not to employ a filter if the basics of its operation are unknown. As an example of a poor job, we mention the one created with a fantasy filter at the request of the IIEE in Figure 3 A, which could be interpreted as a dog. The idea is not to argue if the subject is a dog or not; all that is shown here is that this particular work is poorly executed. The diagonal lines that betray the presence of motion blur are highly visible, and one of the legs is unfolded in the same way as in the original photo. Overall, this image has the same geometry as the original, but different coloring. In other words, there is no evidence of restoration in this retouching. The way in which the colors have been altered is also noticeable. 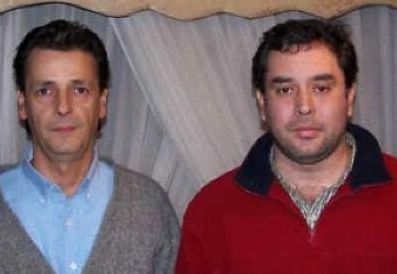 Investigation conducted by physicist Andres Duarte, Scientific Director of CIFAE CHILE. The Kodak report, while not certifying the process of "acknowledgement of objects or external elements within a digital photo" by company policy, has been an important source document in this research. The information confirms that the photo was indeed taken using a Kodak DX 6490 camera. Among some of the conclusions that can be drawn from the CIFAE report, we can say that the procedures applied up to now in analyzing the image of Parque Forestal, and in which some have thought to see a dog, are mistaken. At least in the positions know. In other words, if this image in fact corresponds to a canine, the superficial analyses performed until now have NOT proved it. CIFAE shall continue to analyzing the image and we shall continue to keep our readers abreast of further developments. Translation (c) 2004. Scott Corrales, IHU. Special thanks to CIFAE. "I have no opinion on the nature of what came out on the photo, or else I'll just keep it to myself," said Germán Pereira. The engineer is startled by the stir caused by his snapshot and says that the has received phone calls from Spain, Colombia and Argentina. Pereira, a civil engineer, says that he had to turn off his cell phone in order to concentrate on work, since the instrument did not stop ringing after it was learned that he was the author of a the surprising photo of an alleged alien in Parque Forestal. He's only been a week at his new job and his co-workers don't know that he has been on television and in newspapers, and has recieved calls from Colombia, Argentina and Spain, whose news media want to know more about his story. "I have no knowledge of this, but from what Erick Martinez (of the Corporacion de Investigacion de Fenomenos Aereos--CIFAE) tells me, it seems that it is one of the clearest photos ever taken. It is surely for this reason that it has had such an impact," he speculated. Pereira, 33, is a graduate of the University of Concepción and came to Santiago a little over a year ago. He is an amateur photographer and owns a Kodak DX6490 digital camera. On Monday, May 10 he had the afternoon off, so he got on his bicycle with the camera and went off to Parque Forestal. He took ten photos and was "rewarded" with the image of a tiny grey being walking between two Carabineros (state police) on horseback. This is the image that has gone around the world thanks to websites on paranormal phenomena. -- What was it about that shot that drew your attention? --Look, first I took a photo of the Carabinero patrol that was coming over the nearby bridge. Then, since I was riding my bike, I headed for the northern sector. I took another photo of them from that point, and that's the one on the Internet. --Did you see the alien in the [digital camera's] screen? --No, I saw it the next day, when I downloaded the photo. --And what did you think? --I was impressed, that's all. I saw it with a colleague and we found it odd. I thought that it was the same impression everyone else who saw the photo must have had. It's rather shocking. The fact of the matter is that I didn't see it when I took the picture. --Do you recall seeing anything odd at the time? No, nothing at all. And I also asked myself that when I checked the photo, I tried to recall what was there. It would have been ideal to have seen it when the photo was taken, by I saw nothing strange. I was interested in taking a photo of the mounted patrol. --If it was an alien it should have come out in the other photos you took that day. --Yes, it could have come out, but it appears in that one only. Now, the other (photos) are from other areas. --Had you ever had any similar experience? --In fact I'd never had any experience of this type, nor was I very involved in UFO or alien matters. I don't know it that's the true nature of the matter, and that's why I stepped back from it and turned it over to people who deal with the subject. All I know is that it isn't a photographic error. I also know that it isn't a hoax, because I'm not behind it. The photo is still there, still inside the camera. I haven't wanted to erase it. --I want the Kodak people to see it. In fact, I have to phone them. --How did your photo reach the Internet? --What happened is that on Tuesday, when I downloaded it to my computer, I mailed it to a friend in Concepción. He sent it to the people of CIFAE and to another two parties. That very same day Erick and I met up, because they were the first to believe in the photo. --And what's your opinion of all this? --I have no opinionon the nature of what came out on the photo, or else I'll just keep it to myself. In any event, one can see something that appears to walk, has a arms and a head, but I don't really know what it is." --Are you into UFOs? Have you had "close encounters"? --No, no sightings. I don't lose any sleep over the subject, but I find it interesting. And with this stuff the same, if not more so. --Have your co-workers bothered you? --No. I think that maybe now the will. The day I took the photo I was with another company. I've only been here a week. They don't even know me. Translation (c) 2004. Scott Corrales, IHU. Special thanks to Liliana Núñez O. One of the better-known stories is the presence of an alien in the photo taken at Parque Forestal. 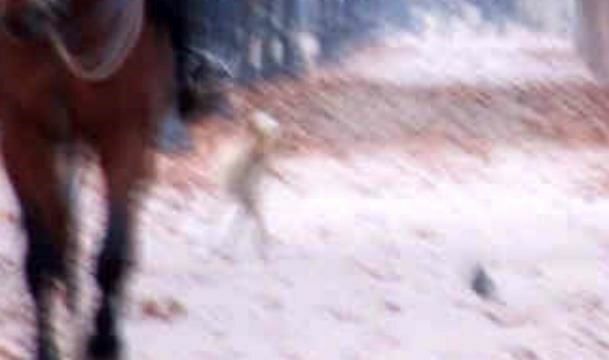 The strange character that appears near the mounted policemen's horses is very similar to the "Greys", whether on account of its macrocephaly or its elongated arms. What is odd is the creature's size, since tests to the digital image show that its height would not exceed 80 centimeters. Some ufologists state that there is no precedent for such small extraterrestrials, therefore this possibility has been discarded. However, UFO research has always been based on eyewitness testimony and photo evidence, therefore a new concept of space beings, smaller in size than those hitherto known, would be a new line of research. Without a doubt one of the most accepted theories by the public regarding the strange creature. Certainly the characteristics that can be made out on this entity are similar to the ones described by those who have seen imps, whether on acount of its size or its greenish hue. Furthermore, these mythical creatures are believed to inhabit places filled with trees and flowers, making it not at all strange that Parque Forestal should form part of their habitat. Experts in manifestations by these entities reinforce the theory that imps can only be seen by certain people, since they belong to another dimension, and that a digital photograph could be a good option for seeing them. 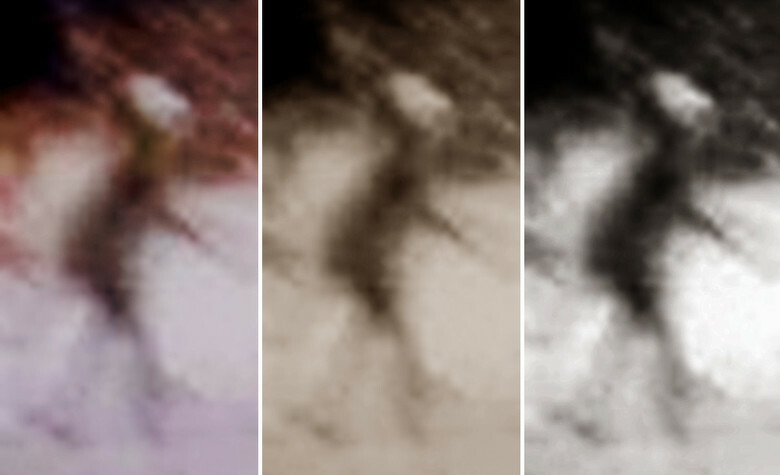 Cyberspace is filled with countless photos showing specters or ghosts in poses similar to that of the Parque Forestal creature. Among thousands of photos, a good number of them are fakes, but an equally significant amount has not been dismissed as hoaxes. Therefore, within the possibilities of this image, the possibility of a ghost could easily coincide with many others of its type. The trails of Parque Forestal are covered with many leaves and branches that constantly fall from the trees, especially during the fall. For this reason, one of the theories put forth explains that one such branch could have created the capricious image of a walking alien. The blurriness of the image could lend credibility to this explanation. Another theory posited states that a small child was walking between the two Carabineros horsemen. This is not unlikely, since such things happen constantly in that area of the park. But upon studying the image and being's size, the child could not have been more than a year and half old. As the image shows, the creature walks erect and its body does not present the characteristics of a child of that age. Furthermore, there are no signs of clothing covering the body of the alleged child, and the neck is absent from beings quasi-deformed head. However, the sweep of the image deforms the possibility of evaluating details such as clothing or other traits that could make this the solution. What would an ape be doing in the middle of Parque Central? Well, its one of many interpretations of this image. The characteristics of the "creature" could be projected on a small ape who had escaped at that time from the zoo or from a private home. What is odd is the color of the alleged ape, aside from the calm way it crosses between two animals of far larger size than its own. For those knowledgeable in the subject, it is easy to capture a significant light and shadow play which can mislead us easily. Upon observing this photo, we can see that there are several patches of light between the leaves. These give the sensation of possessing a color that is similar to that of the strange being. We also see another light spot over the entity's body, suggesting an object on its back, which could be interpreted as a rucksack, but is only light play after initial analysis. Under this premise, we cannot dismiss the possibility that the phenomenon photographed by German Pereira is only the product of light and shadow play. One of the most common tricks when creating photos of this sort is the superimposition of images, whether through a computer or employing sophisticated design programs, which aid us in constructing photos with external elements. This can be done by taking a photo obtained by a conventional original (a traditional photo with a chemically-processed negative) which has been scanned and then digitized. Then, an external element is attached (as strange figure or other object. After printing it on a laser printer on high-quality paper, it can be photographed using a digital camera, obtaining the result we have come to know. One of the photos limitations is the sweep generated by the digital camera, which blurs the image, making it impossible to make a firm conclusion. But the most curious detail is that these "sweeps" are hard to do with a digital camera. Digital cameras generally operate as sensitivities of 100, 200 and 400 ISO (standardized sensitivity units between ASA and DIN, which are the U.S. and German units, respectively). This means that the exposure speeds for an outdoor shot on a clear day (such as in this photo) would never be lower than 1/100th of a second. A sweep of such a magnitude could never be obtained at such a speed. The photo would be underexposed (in its original) for which reason the contrast (luminance) or colors (chrominance) cannot be fully seen, which are needed to distinguish capacity and depth in each cell. Another possibility is that it was all concocted at the site of the events, creating the impression of a being calmly walking among two mounted horses. When looking closely at the image, we can see that the at the second post to the left of the photo, there is a diagonal element supported toward the ground. This could be a stick, but its thickness could readily represent one of the legs of a tripod supporting the strange character. Translation (c) 2004. Scott Corrales, Institute of Hispanic Ufology (IHU). Special thanks to Camilo Valdivieso, Terra Networks. Insider Exposes The Reality Of The Alien Presence! Photographer caught flying humanoid above plane near Cairns airport, Australia?